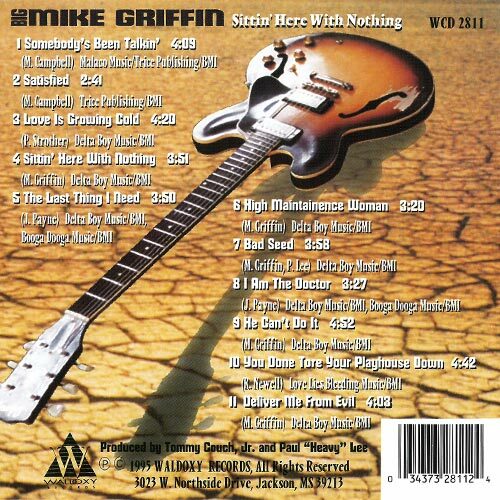 "When it comes to the blues, Mike Griffin is the real deal. Lots of players claim to be blues musicians, but all it takes is one listen to realize that Griffin not only plays the blues - he LIVES the blues. From his smoky, soulful vocals to his stinging, singing guitar playing, Griffin makes music that penetrates right to the bone with emotion that you can feel as well as hear. It's a sensation that will chill you, thrill you, and full-fill you." Sittin' Here With Nothing is Griffin's third Waldoxy release, and as the saying goes, "The third times the charm." 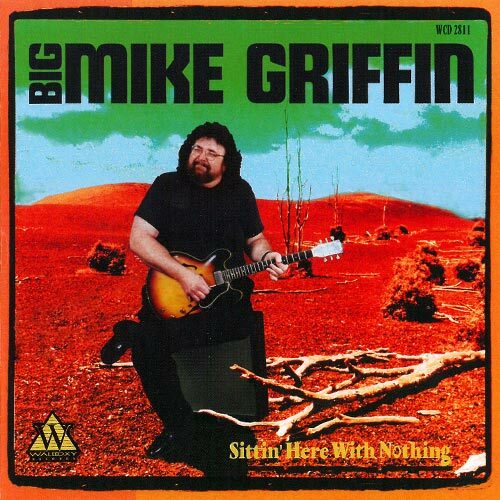 Recorded at Alabama's legendary Muscle Shoals Sound studio, the album captures Griffin and the band at their best - relaxed, upbeat and burning. 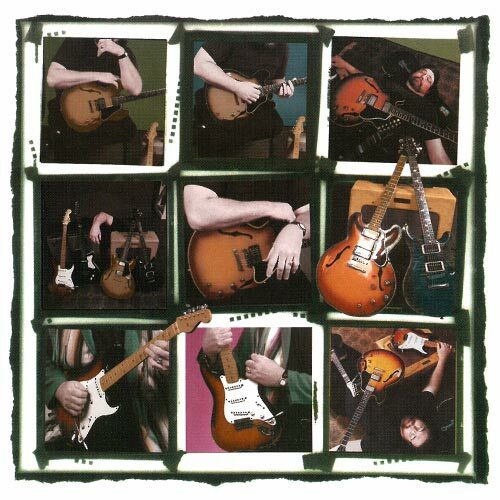 Griffin's guitar solos talk as if they were directly linked to his powerful, gruff singing. When it comes to the blues, he can play it all whether it's uptown and jazzy or lowdown and rockin'. For a taste of his versatility, check out his funky rhythm work on "The Last Thing I Need" his melodic, sophisticated solos on "He Can't Do It" and his gritty slide on the album's title track. Griffin's stellar backup band adds just the right amount of spice and substance to the music. From his gospel-inspired piano licks to his fat, Staxlike organ rhythms, Clayton Ivey turns in a smoking keyboard performance, which is highlighted by his solos on several cuts. Bassist David Hood and drummer Pat O'Connor provide a swinging grooving backbone that propels the songs like a '50 Mercury running on rocket fuel. You'd be hard pressed to find a better horn section than Terry Townsend (trumpet) and Dennis Taylor (sax), whose lively accompaniment adorns several songs with the potent punch of a heavyweight champion. Add guest drummer/percussionist Paul H. Lee and you've got a surefire recipe for 100% blues satisfaction. 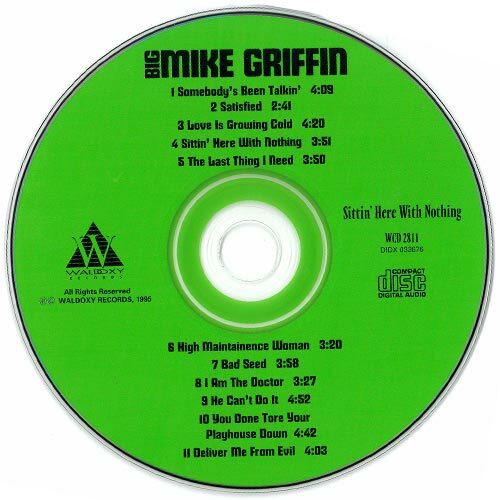 Dont miss Mike Griffin and his band if they happen to be playing at a club or festival near you. But just in case you miss your opportunity, take this album home, pump the volume up and "meltdown" grab your honey, and kiss your troubles good-bye." Very Special Thanks to: Milton Campell and to all my friends and fans, God Bless You!"